GUEST ARTICLE - Which Comes First: Infrastructure or Economic Development? GUEST ARTICLE – Which Comes First: Infrastructure or Economic Development? This Guest Article for REVITALIZATION was written by Ben Levenger. There’s a question that plagues many small to medium-sized communities across the United States. It stems from the debate about which process should be prioritized as a catalyst for change within a community. Put simply, what do we need to do first (infrastructure or economic development) to kick-start the sort of change that will make our communities the way we want them to be? The quick answer is that there is not a standard answer — no “one size fits all.” Each community is unique. While many communities have similar traits, such as population, income, density, etc., each has residents and visitors who have specific needs and desires. 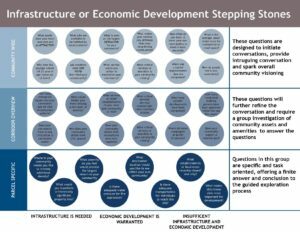 It is these needs and desires that will influence the answer to that common question: “Which Comes First, Infrastructure or Economic Development?” In short, each community will have its own reasons for deciding where to start. Knowing that there are not cookie cutter answers doesn’t mean we can’t help a community determine the best process to meet local goals. This term is standard in the education or instructional fields, where it is intended to present students or individuals with a series of specific questions or prompts to help them develop set of answers or goals based upon self-exploration of available resources. Economic development: A term that communities loosely use to refer to any private development within the community that provides an improvement to the community, fiscal or otherwise. Common community goals: A set of unified community goals or visions that are derived from a detailed community-input campaign. These goals are specific, action oriented, and measurable. They create an actionable framework for implementation. These are designed to guide a community, including local residents and elected officials, through a community transformation decision-making process. They are critical to helping shift the community from the broad picture to a narrow or specific set of tasks or priorities. The list of questions below is broken down into three categories: Community Wide, Corridor Overview, and Parcel Specific. These categories are provided to outline a standard process that will follow the broad-to-specific questioning approach. It is through using these questions that your community can start discussions about which method of community revitalization, or mixture of methods, will provide the best return on investment for your community. 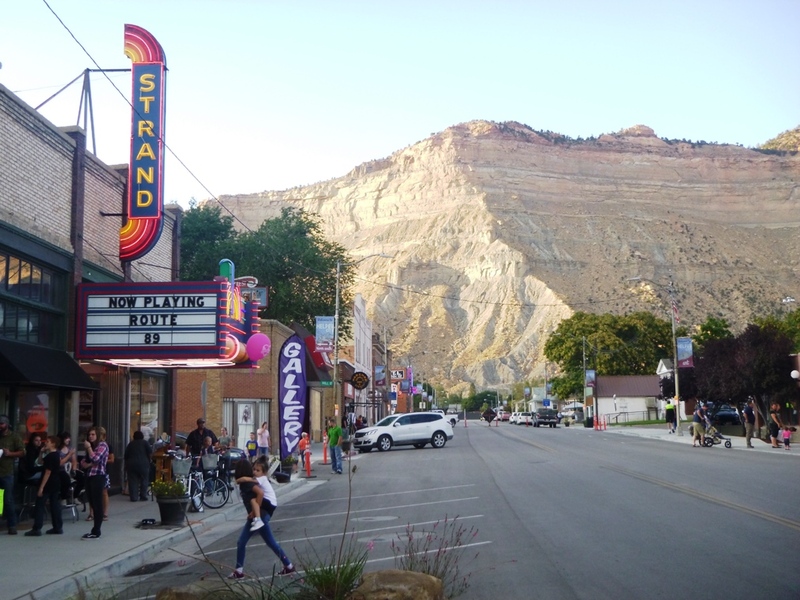 While there is not a specified path or required set of questions, the sample questions below will help municipal or Main Street staff provide a focus for their community-revitalization efforts. What assets do your town have that are ATTRACTORS? Why are younger people (18–25 years of age) moving out of town? What jobs are available to be filled by local residents? If a stranger were to walk down a local street in your community and ask you to describe your community in ONE WORD, what would that word be? What do you see as the largest DETRACTOR for your community? When talking to prospective new residents, what are the words you use to emphasize the good points of your community? What makes your community different than your neighboring communities? What critical services or amenities are your community missing? These can include retail/commercial establishments, hospitality services, restaurants, or even recreational assets. How often do you have to leave your own municipality to meet a basic necessity or receive a service? When was the last time your community completed a capital-improvements plan? What is the average lease/rental rate for commercial or retail space within your community? How many emergency repairs have your community’s vital infrastructure systems (sanitary sewer, drinking water system, roadway, etc.) had within the last two years? What would hinder you from using a new asset or amenity within your community? What services or retail establishments do you leave your community to visit? What critical services are your commercial/retail corridors missing? How many private developments have been completed within your community within the last five (5) years? How many residential building permits (new home constructions) have been approved within the last five (5) years? Is it easy for residents and visitors to access your community’s assets? How does your community use their civic spaces (plazas libraries, etc.)? Does your community use their community-owned recreational amenities regularly? Where do locals congregate or gather frequently? How often does your municipality poll the public for input? Does your community support a common goal? What community-level service or amenity is most widely accepted and backed by residents? If development is desired in a central location, where would it be? What areas of your community have the highest Average Daily Traffic Count? Where in your community would you like to see greater density or more amenities? If development were to happen at a specific parcel, would there be adequate water pressure to support fire-suppression systems? Is there adequate transportation or linkages for individuals to reach this site using all methods of transport? What makes this/these sites most important for development? If money were not a consideration, what would you transform a historically significant property into? As a follow-up question: What amenities or services are missing to make this a reality? What one key service or amenity do you feel would provide the largest financial return to your community? What one service or destination location would you like to see within your own community that you regularly use elsewhere? What establishments/businesses in your community have recently closed? Why did they close? The above questions are merely suggestions. They can be tailored to help your community through the guided exploration process. 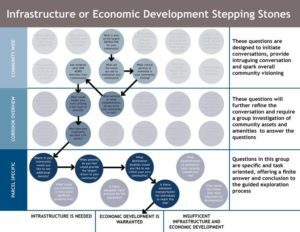 While the above questions are often seen in a Strength, Weakness, Opportunity and Threat (SWOT) analysis, the manner in which they are asked, answered, and reviewed will guide community residents and elected officials to answer the question: which comes first — infrastructure or economic development? 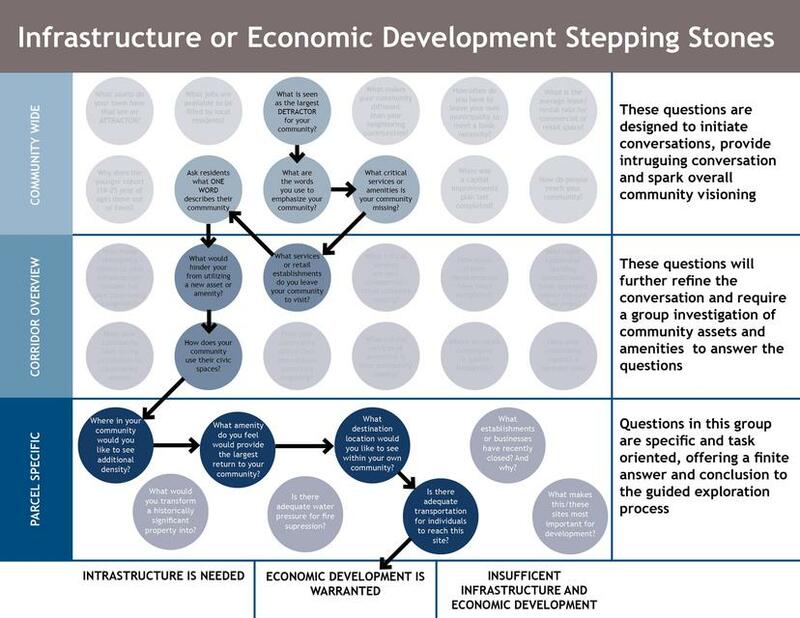 This process guides the community through a series of broad to specific questions, helping to better frame and define parameters for the discussion of infrastructure or economic development. By removing the extraneous or potentially less important questions, participants are able to move expeditiously to create a clear vision for their community along with the necessary steps to fulfill that vision. This process has no set path to meet a predetermined point. It can often take a very indirect route. Therefore, Downtown Redevelopment Services is a proponent of using the stepping-stone method for question review. Illustrated below is a sample of the stepping-stone process. 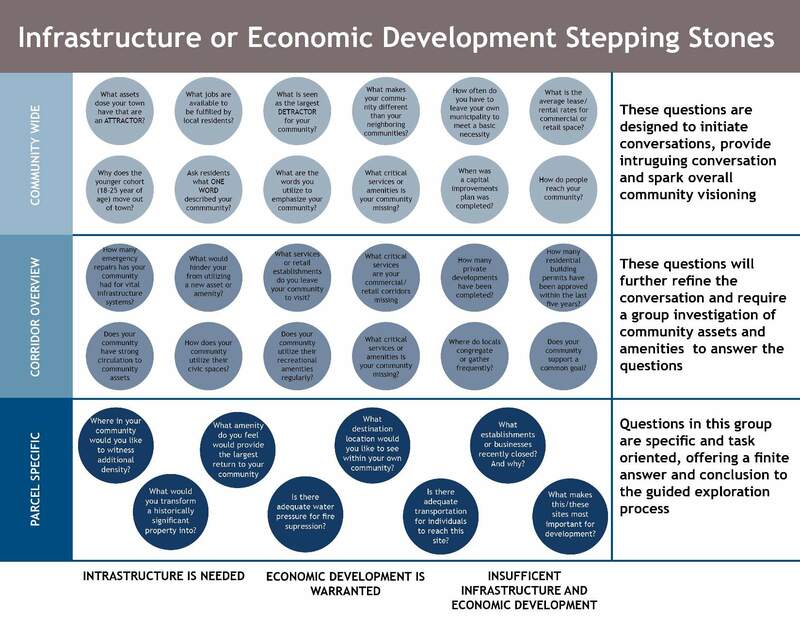 Questions in the sample stepping-stones chart to the right (click for larger view) can be amended to meet the needs of your specific community. The document template can be provided in Adobe InDesign upon request. This stepping-stone flow chart illustrates a sample process that allows for “lateral movement” in the question process. It is critical to ensure that all participants feel their voice is being heard and this may require additional questions within each category, or even regression to previous categories based upon detailed discussion. The above visual illustrates a process that is not defined, yet it is specific to a community. At the end of each section, the goal is to create a more defined set of parameters before moving onto the next level of questions, creating a flow chart for the process. This flow does not always have to progress vertically. In areas of tough discussion or debate it will progress laterally. It is this lateral movement that helps create the “stepping stones” metaphor for this style of guided exploration. Through using this process of broad to specific questions, the community will be able to determine the best revitalization process for them. Inadequate space for further private sector development. Economic development is necessary to meet the demands of the community. This determination is documenting that in this community local residents do not identify a lack of infrastructure or resources but a lack of amenities or assets that attract people to the defined area in question. This determination can be verified through a detailed market analysis to discover the “gaps” in services that may need to be provided. Both infrastructure and economic development are required. This determination is stating that this community lacks necessary infrastructure systems, access, assets, and amenities. This condition is rare as most municipalities have either services or assets, but it can happen in communities that have experienced economic hardship and a marked drop in population. While the three determinations listed above are typical for communities, do not despair if your community does not fit neatly into one of these categories. In community and downtown planning there are no “guaranteed” answers. We hope that this article has been informative and that you will be able to use this process to prepare catalysts for change in your community. While the above process is not foolproof and may not provide definitive answers for your community, it is our hope that it will be able to provide a more tailored and attainable revitalization process. If you are using this process within your community, or will be in the near future, and would like some feedback, Downtown Redevelopment Services is always happy to discuss the process and provide pointers at no cost to your community. Ben Levenger is the president of Downtown Redevelopment Services, LLC, a boutique planning firm specializing in downtown planning for small to medium sized communities. He has provided downtown planning services for communities across the United States, focusing on providing a clear and concise “roadmap” for underserved communities to follow to achieve a successful revitalization effort. 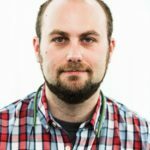 Notable communities that Ben has assisted over the last ten years includes: Pittsburgh, PA; Moab, UT and Zelienople, PA. 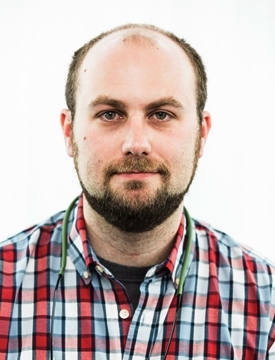 In addition to running Downtown Redevelopment Services, Mr Levenger serves as an adjunct faculty member at Kent State University in the Landscape Architecture Program, As an at-large member of the Cleveland section of APA and a member of Cleveland ULI.